Bags of coffee. Cafe 1880. 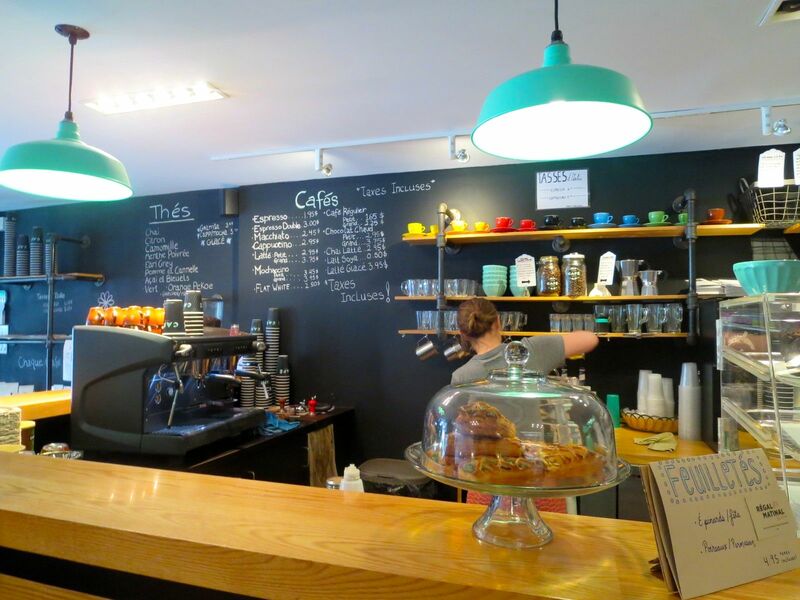 With Indie Coffee Passport in hand (read our take on it HERE), I head to my second stop in my whirlwind coffee tour to Café 1880, a shoebox of a café near UQAM close to Rene Levesque. The black, white, teal colors give a tidy ambiance to the establishment as does the very clean handprinted menu and signage. Everything has a trendy coffee-shop retro Italian feel, especially the teal overhead lamps, the pretty teacup and saucer sets in a rainbow of colors (for sale too! 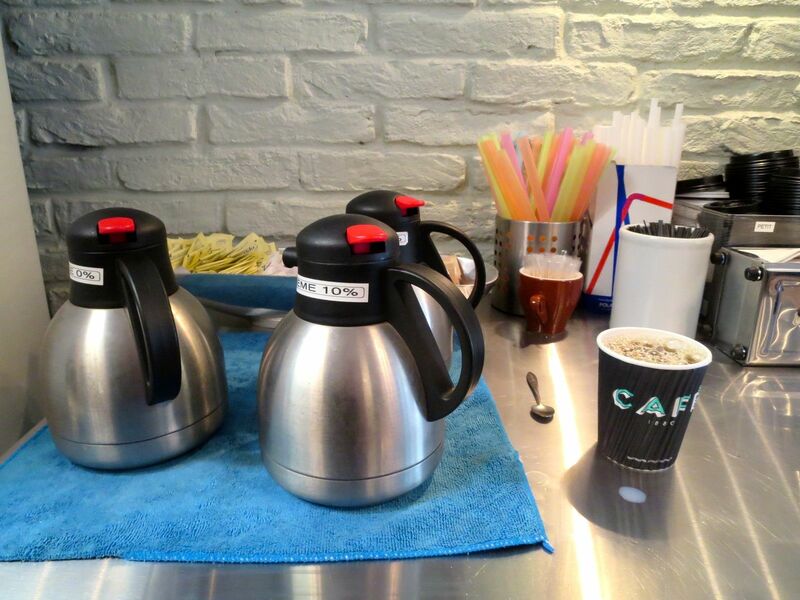 ), and the coffee bar where customers order as well as sit. Just add a bicycle and some more chrome n’ mirrors, and you’ve got Cinema Paradiso. Cafe 1880. Photo Rachel LEvine. The staff is both nice and efficient, something I find these independent coffee establishments don’t really focus on getting well. The barista smiles with each drink delivered from the bar, and the cashier busies himself with disciplined seriousness. A steady stream of customers ensure that there is never a moment’s rest. 8 oz of Cafe 1880 coffee. Photo Rachel Levine. Of course, the ultimate mark of a coffee place is its coffee. Mine is strong and masculine, the kind where the caffeine thumps the chest. Montreal’s own Cafe Union is the brewer. The passport gets me a small cup of coffee, though there are other choices (Latté, Mocha, Espresso). 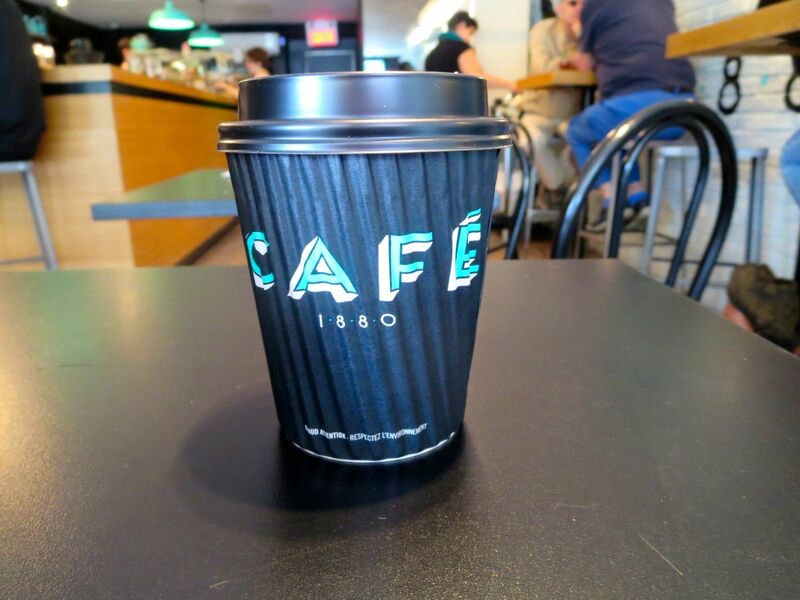 While there is this trend of serving 8 oz size cups of coffee and charging way too much for it, the price of a coffee at Cafe 1880 is a very budget friendly $1.65 for a small (8 oz) and $2.25 for a large (12 oz). Other drinks on order are the usual suspects: teas, espresso, macchiato, cappuccino, latté, and the like. Soy milk is extra. The only drink that makes me pause is the curiously named “Flat White.” Oh, and the chai latté is made with a tea bag, not syrup, and kissed with honey on top. Authentico! Food includes a selection of savory and sweet pastries. 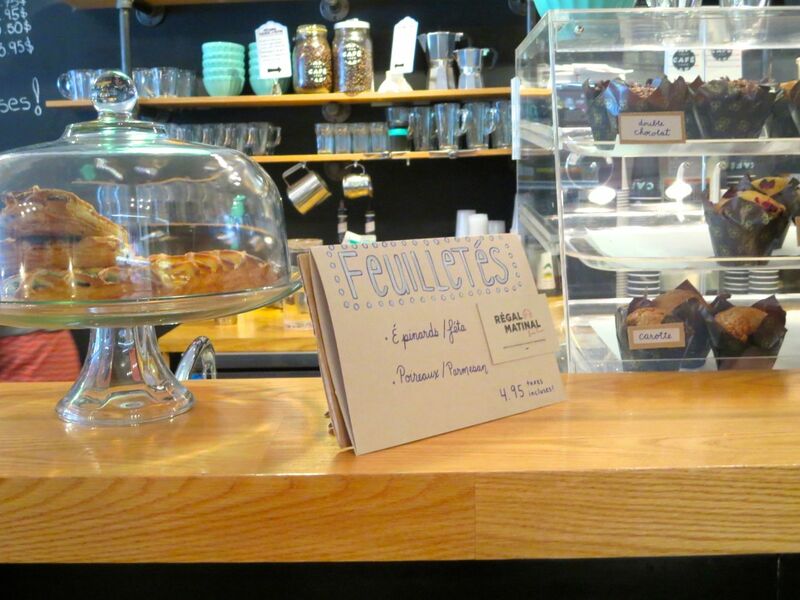 Felix and Norton Cookies, Premiere Moisson donuts and croissants, and some rather good-looking Feuilletés by Régal Matinal put in a diner cake display. Internet is provided. I notice a few plugs along the wall for those who need to recharge their computers or phones. Noise level is mostly clientele talking and as the clinente is primarily students, it’s, well, chattery. All the better since I have an immediate dislike to the music and there is an incessant buzz from a large display fridge with sandwiches and soft drinks and yogurt. When the fridge ceases its racket and the students leave, it’s actually a very pleasant place to while away an afternoon. Cafe 1880 is worth walking an extra block or two for. Cafe 1880 (1886 St Denis) is open Monday-Thursday 7 a.m.-6 p.m., Friday 7 -4:30 p.m., Sat 7:30-4 p.m., and closed Sundays. Madame Butterfly : That Old Opera!